This week we finally had the chance to see real live spring baseball action. On Saturday I was eating a bagel, drinking coffee, and watching Mets day baseball. As I sat on my couch doing all of these incredible things simultaneously, I realized I haven’t felt this alive in months. ‘Tis the goddamn baseball season. 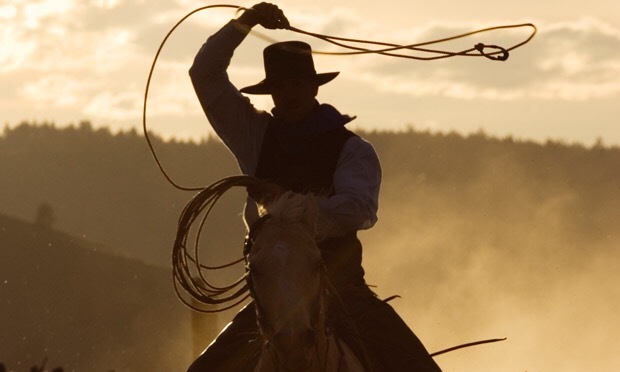 Lingering Tenderness: With the return of Mets baseball, we also saw the return of lingering tenderness. Zack Wheeler had a tender elbow but a day later he said he was fine. Lucas Duda still has his sore back. He’s been having spasms and getting cortisone injections in his hips. 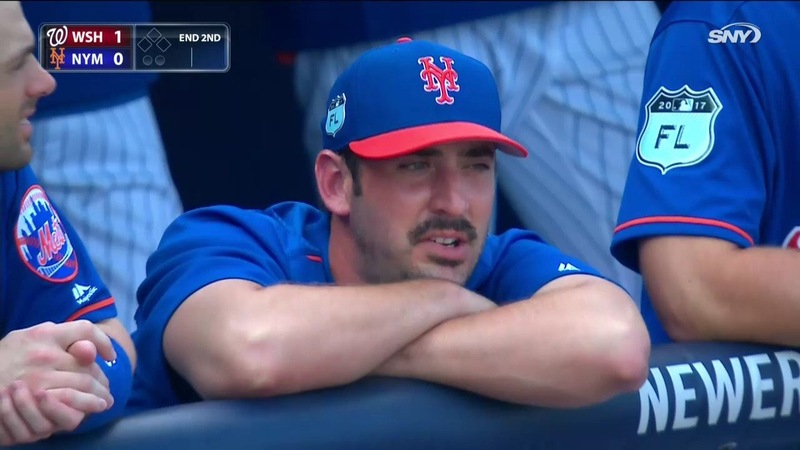 And then to top it all off, on Saturday this happened to Kevin Plawecki. 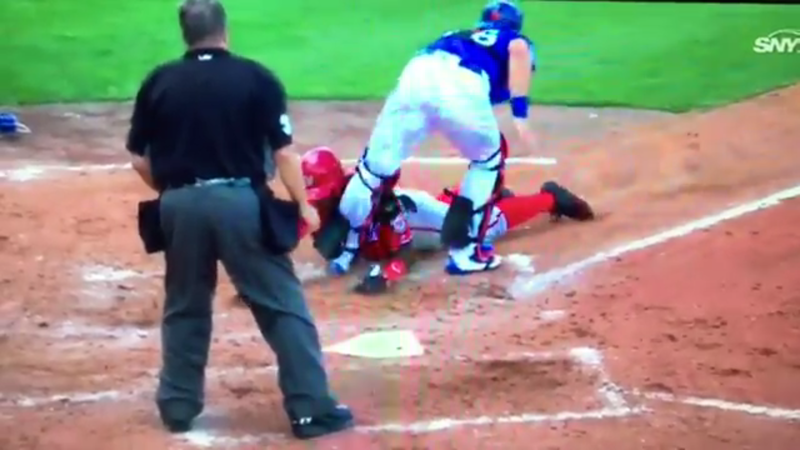 It looked like a torn ACL or a hyperextended knee, and it was undoubtedly a bush league garbage slide by some piece of Nationals trash. But Ray Ramirez said it was a left knee contusion and X-Rays confirmed Plawecki’s leg was okay. For a second I was really worried we were going to lose our mediocre third string catcher. Earn The Spot: Michael Conforto has been raking to start camp. He homered in game one on Friday, and he homered on Sunday. You know what? GOOD!!!! That’s what he’s supposed to be doing. All of these stupid fans screaming for the team to trade an outfielder every single time Conforto singles or Jay Bruce is shown on camera. Shut up! Depth is good. Let’s watch Conforto earn his spot. And Duda is already sleeping on a wooden plank to help heal his lingering back problems. We will need every single player on the roster. Relax!!! 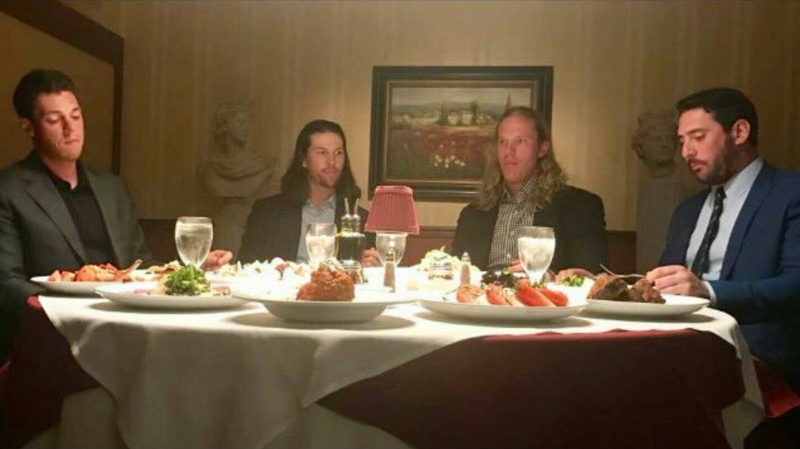 Hopefully The First Of Many Suppers: This Last Supper-esque picture sent out by the Mets aces this week is pure gold. I spent so much time last year crudely editing my Metssiah cover photo of the Mets Last Supper in MS Paint. Little did I know that a year later the horses would take their own version. This photo is already perfect. All it needs to take it to the next level is Ray Ramirez hovering behind the aces dressed as the Grim Reaper, Zack Wheeler dressed as the waiter serving the other aces their dinner, and Bartolo Colon in uniform standing behind Noah Syndergaard staring at that painting on the wall while eating a giant turkey leg. 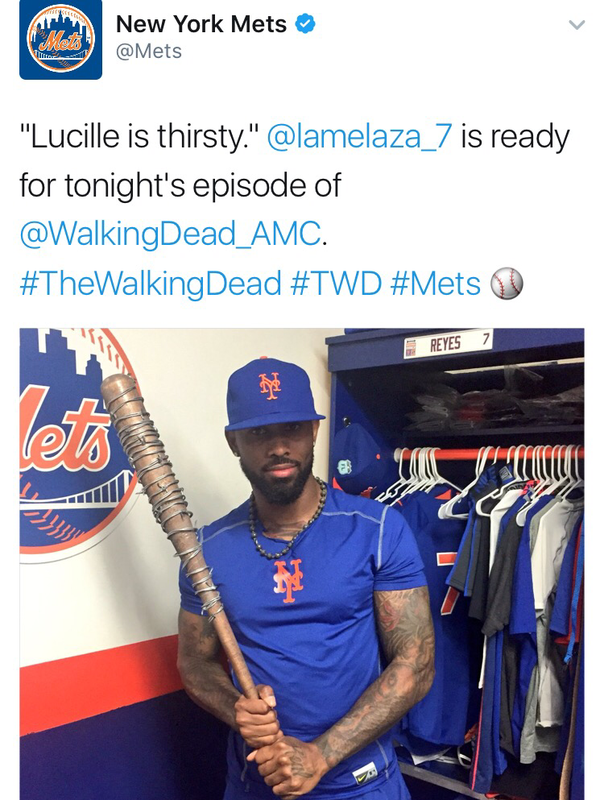 Reyes With A Weapon: Teams across Major League Baseball recently tweeted out a number of Walking Dead Season 7 promotional pictures, and the geniuses in the Mets organization decided to join the fun by tweeting (and quickly deleteting) this picture of Jose Reyes holding a bat covered in barbed wire. Hey Mets! Here’s a little advice. If you are looking for a player to be featured in some sort of TV related promotional campaign that involves families or weapons, you should probably avoid using your two players that have been arrested for domestic violence. Just a suggestion. Cespedes Car Stories (Still?!? ): This week the mainstream media once again threw a bunch of Yoenis Cespedes car headlines in our faces. I honestly have no interest in seeing any more Yo car headlines unless the headline is actually newsworthy. 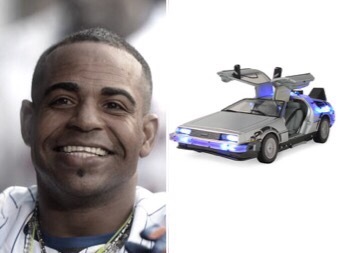 I’d certainly check out a Yo car article if it was titled “Cespedes Parks Self-Driving Car In Handicapped Spot” or “Future Cespedes Arrives At Camp in DeLorean To Warn Mets About Years Of Losing.” The Yo car stories are old news people. Let’s hear a little more about future young studs like Dominic Smith and Amed Rosario and a little less about what vehicles Yo has in his garage.